When it comes to AI, we think about the knowledge we must transfer to the computerized machines and make them use that knowledge, so they become intelligent. In this regard, one of the first questions we need to answer is on the notion of knowledge. So, what is knowledge? To answer this question we should consider two facts: 1) it is known that knowledge is related to intelligence; and 2) the definition of knowledge should be given with terms from the computer domain. Scientists agree that the concept of intelligence is built upon four fundamental elements: data, information, knowledge, and wisdom. In general, data takes the form of measures and representations of the world—for example, raw facts and numbers. Information is obtained from data by assigning relevant meaning, usually by putting data in a specific context. Knowledge is a specific interpretation of information. And wisdom is the ability to apply relevant knowledge to a particular problem. Intelligent system designers use knowledge representation to give computerized systems large amounts of knowledge that helps them understand the problem domain. Still computers "talk" in a "binary" language, which is simple, logical, and sound, and has no sense of ambiguity typical for a human language. Therefore, computers cannot be simply given textbooks, which they understand and use, just like humans do. Instead, the knowledge given to computers must be structured in well-founded computational structures that computer programs may translate to the binary computer language. 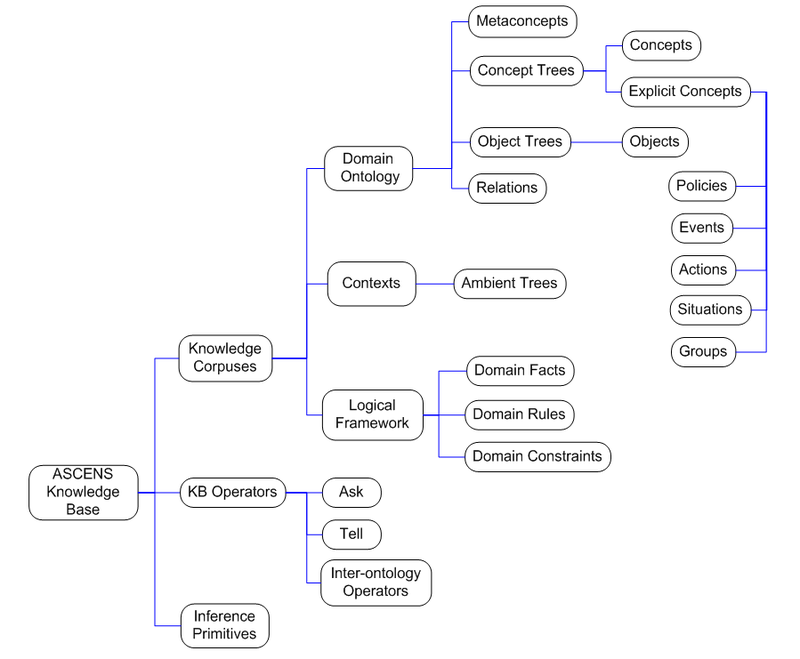 Knowledge representation structures could be primitives such as rules, frames, semantic networks and concept maps, ontologies, and logic expressions. These primitives might be combined into more complex knowledge elements. Whatever elements they use, designers must structure the knowledge so that the system can effectively process and it and humans can easily perceive the results. Many conventional developers doubt the utility of knowledge representation. Fact is that knowledge representation and the accompanying reasoning can significantly slow a system down when it has to decide what actions to take, and it looks up facts in a knowledge base to reason with them at runtime. This is one of the main arguments against knowledge representation. Why not simply “compile out” the entire knowledge as “procedural knowledge”, which makes the system relatively faster and more efficient. However, this strategy will work for a fixed set of tasks, i.e., procedural knowledge will give the system the entire knowledge the system needs to know. However, AI deals with an open set of tasks and those cannot be determined in advance (at least not all of them). This is the big advantage of using knowledge representation – AI needs it to solve complex problems where the operational environment is non-deterministic and a system needs to reason at runtime to find missing answers. ASCENS is an AI project tackling self-adaptation of systems operating in open-ended environment, e.g., our physical world. Such systems need to be developed with initial knowledge and learning capabilities based on knowledge processing and awareness. It is very important how the system knowledge is both structured and modelled to provide essence of awareness. We propose a special multi-tier knowledge structure, allowing for knowledge representation at different depths of knowledge.